We are thrilled to announce that Manitoga's Access Road Restoration Project is complete. 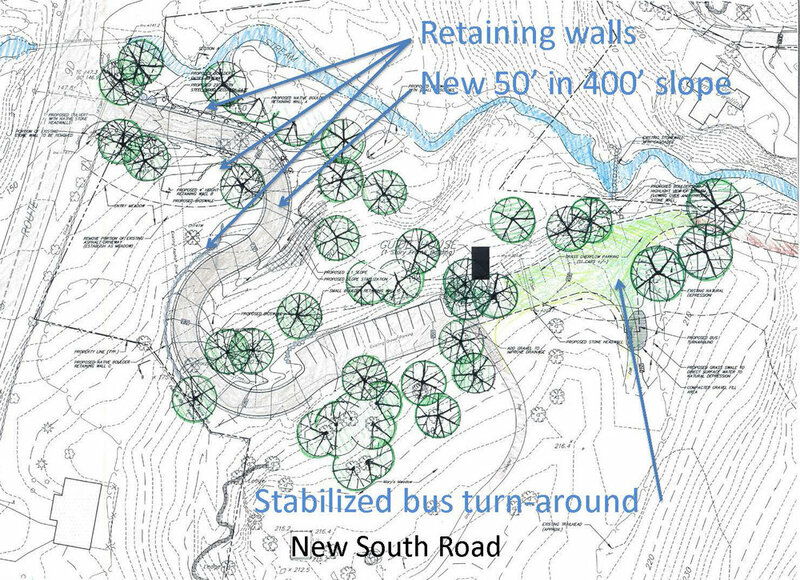 This is a critical first step in Manitoga's overall site stabilization effort that will include storm water redress, Waterfall and Quarry Pool stabilization and restoration, perimeter fencing, and targeted reforestation of our woodland forest. It is also essential for the safety and continued growth of our visiting public. Manitoga was awarded a $200,000 matching grant towards the Road Project through New York State’s Environmental Protection Fund. This important project has significantly enhanced and expanded visitor access to Manitoga, allowing for a greater appreciation of this National Landmark, its vibrant programming, and of Russel Wright’s enduring design vision to live in harmony with nature. The South Road (public entrance drive) has been reconfigured and re-graded with a new culvert system; a turn-around will allow access by multi-passenger vehicles; the parking area has been enhanced and the entrance restored with wildflowers and native plantings. Work on the North Road (private drive) includes a vernal storm retention pond; berms, swales and culverts to address storm water; stabilization of the road edges; and resurfacing the road. The results are graceful and dramatic. Special thanks to Arcus Gift Fund, Jacob and Gale Chapman, EASTER Foundation/Anne & Fred Osborn III, Frank B. R. Sahm, Jr. Charitable Foundation, Lostand Foundation, Melanie Dodson and David Granger Charitable Foundation, Ralph E. Ogden Foundation, and Zukowski Diamond Foundation.